A few months ago I contacted PADMA, the creators of the PADMA NailMat, to ask if I could do a review for them. They were kind enough to send me one! I explained to them that us barefoot runners all have something in common, feeling. We love to feel the ground and anything on it. For centuries, nail mats have been used for meditation and yoga in China and India. 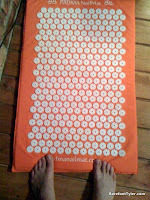 But you don't have to know the first thing about either acupressure, yoga or meditation to use your PADMA NailMat. 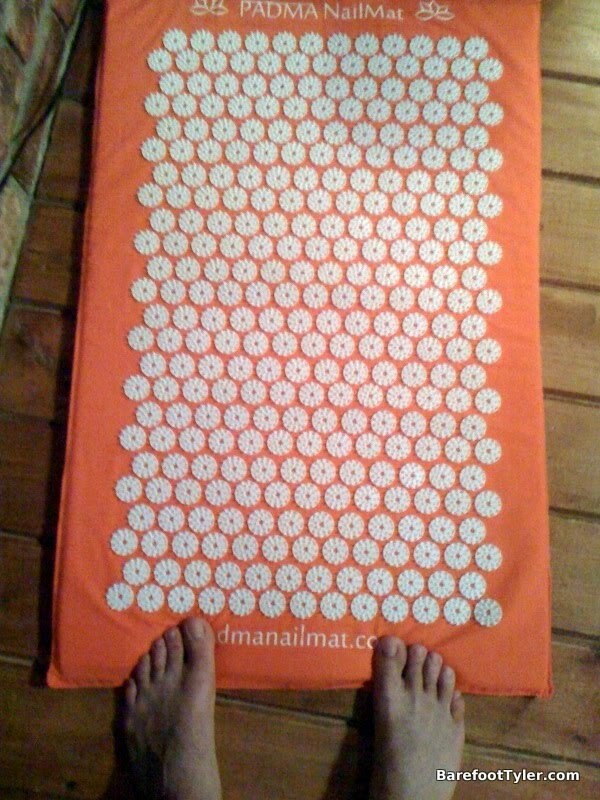 Simply lie down on it and feel the mat start working its magic. Within minutes, you'll start feeling warm and relaxed. You might even fall asleep lying on the mat, and that's quite alright. You can hardly overuse your PADMA NailMat, and the longer you lie on it the greater its effect. The first thing I did when I got the NailMat was read the instructions. They basically said that I can do whatever I want with the NailMat. I can lay on it with my shirt on, off, in any position that I want for as long as I want. I like to use a small pillow to support my head on my hard wood floor. Naturally, I took my shirt off and dived right in! I lay down on it as fast as possible to apply an even amount of pressure across my back. At first it felt uncomfortable. My back kind of stung, but I stuck with it. I layed there for five minutes and decided to get up and let others try. My grandmother loved it! The next day I tried it again. This time it wasn't as uncomfortable. I layed there for 5 minutes and decided to stay a little longer. This time for 10 minutes. I got up and felt nice and relaxed. I have been using the NailMat for about three months now and love it. I lay on it whenever I need to relax and take some time for myself. I can comfortably lay on it for extended periods of time. I found after the first five minutes I completely forget that I am on it and am in a very relaxed state. After some time on the PADMA NailMat I get some cool markings on my back. As red as my back looks, it does not hurt. Actually, when I get up it sends a cool feeling to my back. On the feet the PADMA NailMat is a little different. 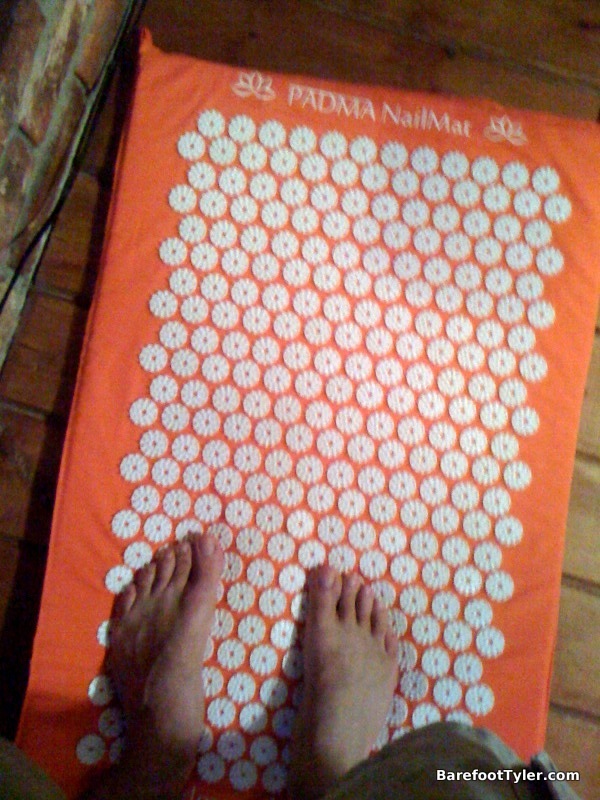 Even with the reduced sensitivity on my feet the NailMat is a bit uncomfortable to stand on. I do, however, enjoy sitting on the couch and put my feet on it. I don't think running in place on it would do much for a barefoot runner as far as training goes, since it gets you used to sharp small objects, which aren't so common while running barefoot. It could, however, help decrease the foot's sensitivity. I will have to try this more and see if it helps with anything. 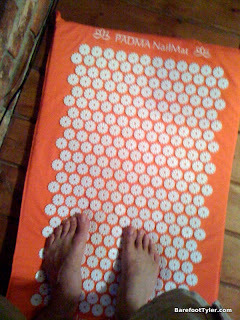 The PADMA NailMat looks like it is a great product that will hold up nicely over the years. It obviously doesn't take much abuse, as I just lay on it. The construction is simple. There are two parts to it. There is the foam inside, and the cloth+nail outside. I have not needed to wash it, but I figure I can just put the cloth part in the washer and air dry it. All-in-all I really enjoy my PADMA NailMat. I recommend it to anyone that wants a new way to relax. 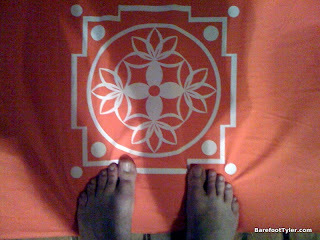 After fifteen minutes on the PADMA NailMat I feel refreshed and ready to continue on with my day. Hopefully you will too. If you are interested in purchasing the PADMA NailMat, please do yourself a favor and use the promotional code KQ76-8382 at PADMANailMat.com for a $5 discount. Looks pretty cool, what exactly made you want one? Besides wanting to try it out, are there any supposed performance benefits? Increase recovery or just to help decrease sensitivity? I just thought it would be neat to relax on one. I didn't know much about meditation or acupressure, but wanted to learn, so I asked them to send me one in exchange for a review. I honestly didn't want to spend money on it since I didn't know anything about it. If I lost the one that I have I would buy it. I think it is more for mental recovery. If I was to run a big race I would use it to relax and clear my mind before the race. I'd like to try it myself. How much is it? Their website seems to be experiencing problems...Thanks! Hoping this helps. Health and Happiness.